These are the photos from the seminar Lance and I did at the 2008 Pennsylvania Airhead Supertech Weekend, February 1-3, in Boyertown, PA. Click on the first thumbnail below to view the large picture and see the detailed caption. Beneath the caption, you can re-size the picture for a larger or small view. On each page, click "next" to advance. You can return to the thumbnails at any time. o	Clymer, BMW R-Series, 1970-1994, Ch. 4. Re optional parts: if you live 10 minutes from a dealer, you can pop over in the car if you screw up your exhaust nut or lose the circlip. If you live 100 miles from the dealer or get all your parts by mail, you might want to stock these spares so you don’t sideline your bike for a week when a 2 hour job runs into a roadblock. O-ring (’78-and-later):Lube with engine oil no more than 15 minutes prior to reinstallation. Maryland Airmarshal Lance McKay, for the use of his R50/5 for most of these photos, his hospitality and the use of his tools and garage, and finally for agreeing to help me with this hare-brained project. Pennsylvania Airmarshal Todd Byrum, for the use of his workshop, and his support and advice in developing this presentation. PA Airheads ROCK, thanks to Todd. Pennsylvania Tech-marshal Bob Sipp, for keeping us on our toes and answering a zillion stupid questions. Al Vangura, for the use of his exquisite cutaway '82 R80/7 demonstration motor, featured in several of these photos. Al is an incomparable machinist, and his beautiful cutaway components have lead many Airheads down the path of mechanical enlightenment. Oak Okleshen, Tom Cutter, and Matt Parkhouse, for their assistance and advice supplied in the preparation of this presentation. Disclaimer: Any errors or omissions in the following directions are my own, and not attributable to any of the above contributors. That said, if you attempt this procedure, you’re assuming responsibility for the welfare of your engine and the safe operation of your motorcycle. If you aren’t confident about proceeding, consult a more experienced mechanic or your BMW dealer. Your comments and questions are invited. You can add them below, following the thumbnail pics, or email me at 4mohans@safe-mail.net. If you expect a response, email me. The finned exhaust nut wrench. Correct assembly of exhaust hardware. Unbolt the headers from the mufflers. Removing rocker arm assemblies and pushrods. Remove rocker arm assemblies and pushrods. Rocker arm assembly with needle bearings. Another way to do it is with screws on a board, and labeled. Remove jug with piston in cylinder. 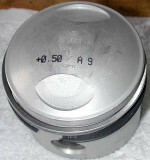 Detail view of piston crown. Prep cylinder base area for reassembly. Cylinder base on jug suitably cleaned. Another view of the cleaned cylinder base. Small o-rings seal top cylinder studs. Close-up of large and small o-rings. Small o-ring on '76-and-later motors. Oil gallery outlet at the top cylinder stud. Correct thickness of sealant application. Applying sealant to cylinder base of jug. New wire clip for wristpin. Seating the seals by installing the bottom cylinder stud nuts first. Reinstall pushrods & rocker arm assemblies. Oak's top end manual -- invaluable! Did the PRT seal replacement, thanks to your step-by-step. Used Suzuki sealer - which was recommended by the local BMW shop and actually carried by them. Thank you for putting this on the web. It was fun to do. Thanks for putting this up. Where does that 'H' shaped jig come from? A relaxed afternoon for an experienced Airhead who has done this several times. At least half that time for quality shop time of Pro Airhead at $$$ per hour. One hour per side at $100. $200 plus parts. Really, if you do not have a tech/mechanic aptitude and background, but you can danged well read and follow procedures, Oak's Manual is all you need, comprehensive with proven best practices at low cost. in these modern oils. (ZDDP is an anti seize zinc phosphate compound needed for wear protection of flat tappets). I understood that clearances could be set tighter on the aluminium alloy pushrods (introduced late '70s? ), because they had similar thermal expansion coefficients to the aluminium barrels, at least when compared to the older steel pushrods. Someone else may be able to shed more light on this. tightly than the specs, whats your opinion on this subject. Thanks for posting this great pictorial step by step! I had some questions about the parts I need to replace the PRT seals and cylinder base gasket. This cleared things up . A great help! how much a service like that cost?